Fans of DJ Green Lantern’s Invasion radio show were in for a surprise during Monday night’s broadcast when the King Of Darkness, Tech N9ne, called in. Wasting no time, the hosts asked Tech about his latest album, All 6’s And 7’s. Tech confirmed that he had in fact finished the album and was currently enjoying the final master copy. He spoke about his collaborations with J.U.S.T.I.C.E. League, including the track “Boogeyman” that also features Stokeley Carmichael of Mint Condition. Tech revealed that the name and concept of the track originate from his initial meeting with Lil Wayne. Tech went on to discuss his many collaborations for the album, which include Lil Wayne, T-Pain, Busta Rhymes, Twista, Yelawolf, Mint Condition, The Deftones, Snoop Dogg, E-40, and Blind Fury. 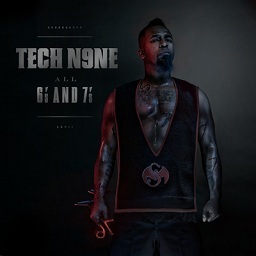 With All 6’s And 7’s so close to its release, Tech is just as excited as the rest of the world.